Some online bingo sites just have the habit of giving strange names to their operations and Betboo Bingo is no exception to this rule. It has an online operation that is formidable despite the weird name and it is definitely a place you should consider for your online bingo gaming needs. The software package utilized by Betboo Bingo is one that doesn’t really have much that can be said about it. It is not a bad software package, but it is also not one that really heavily defines the online bingo site that it represents. It is a good software package with decent graphics and great functionality, but it is just there to help you play the game. It will not overshadow the game in any way and it will blend into the background, not distracting you from the game that you are playing. Betboo Bingo is actually part of a much larger network of gaming that offers many different games for you to choose from. Betboo Bingo however does offer both normal online bingo rooms with conventional rules as well as video bingo that you can use if you’d like something that is more of a cross between traditional bingo and traditional slot machine gaming. Both are great approaches to the game, but the conventional bingo is the real bingo where you cross off numbers under letters as they are read out at the front of the room. Generally speaking, the main bonus that Betboo Bingo offers is their main signup bonus. This bonus is worth 50% up to $300 and it is a great way to start off your online bingo experience. That being said, if you are willing to adopt EntroPay as your main deposit method, you can gain an additional 50% bonus for every deposit after your first one that is made through that payment method. It is possible that other preferred payment methods may get bonuses in the future, but for now that is not the case. No bets are accepted from US players at Betboo Bingo. 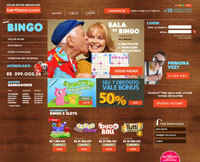 This particular online bingo site has completely withdrawn from the online gaming market in the United States. FAQ documentation is available on the website if you need help with any aspect of Betboo Bingo. However, there is also support available from customer service representatives if you want it. Live chat support is readily available on the help section of their website. Alternatively, you can send an e-mail to support@betboo.com or fill out the form on the website if you’d like to get support through that method. Betboo Bingo has all of the ingredients required for an online gaming site to be great. It is certainly one of the strongest online bingo sites today.